Gerber offers timeless and elegant faucets that will give your room a touch of effortless class! We offer a top-notch selection of Gerber plumbing supplies so you can keep your faucets running like new for years to come. If you're planning on switching some of your fixtures out, we have you covered there as well. We offer Gerber faucet parts, Gerber toilet replacement parts and sinks. Each one is built to outlast many of your standard parts, and we want to be your retailer for Gerber faucet cartridges and Gerber plumbing supplies. If you're looking to give your bathroom or kitchen an elegant, fresh look, look no further than Gerber. It's an immediate way to update any room without breaking your budget. Gerber's product range includes residential vitreous china, commerical plumbing fixtures, electronic faucets, electronic flush valves, residential and commercial faucets, tub & shower fittings and bath drains. View our online collection of Gerber bathroom faucets and plumbing fixtures. Gerber offers decorative bathroom sink faucets, tub-shower valves and accessories to match. All Gerber bathroom faucets are available in decorative finishes like brushed nickel. Shop our selection of Gerber commercial toilets, faucets and fixtures today! We carry the complete line of Gerber Kitchen Sink Faucets including pull-out spray and traditional two handle designs. Gerber offers decorative kitchen faucets in amazing finishes like Chrome, Stainless Steel and Oil Rubbed Bronze. Shop our selection of Gerber laundry faucets today! Shop our selection of Gerber lift rods today! Shop our large selection of in-stock Gerber repair parts today! Shop for Gerber Vanity Cabinets in several style options for a perfect fit to your bathroom decor! Shop for Gerber Vanity Sink Tops in several style options for a perfect fit to your bathroom decor! 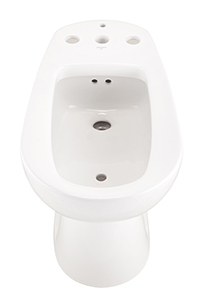 Shop for Gerber Vitreous China Fixtures including toilets, lavatory pedastals and more. Gerber manufacturers high quality china products in several finish options for a perfect match.